2014: A Predictable Year for the Oscars? I had written a whole, much longer piece on this year’s Oscars but while watching the BAFTAs this weekend I realised that I really didn’t have anything surprising to say. With that in mind you may or may not want to read on. (I’ve probably just ensured that this is the least read post on the blog but that’s okay, The Odd Life of Timothy Green has had that honour long enough.) The fact is that, more than any year in recent memory, these Academy Award winners seem like a forgone conclusion. I had thought at one point that American Hustle might do an Argo and win over much better films but now it seems that 12 Years a Slave is going to be chosen as best picture. I may want it to go another way but Steve McQueen’s film will be a worthy winner. There was a time in the 90s when it seemed that best director and best film always went to the same picture (Dances with Wolves, Silence of the Lambs, Unforgiven, Schindler’s List, Forrest Gump, Braveheart, The English Patient, Titanic) but this run was broken in ’98 when we saw Steven Spielberg angrily shaking his brand new Oscar because Saving Private Ryan lost to Shakespeare in Love. Of course it didn’t happen last year because Ben Affleck wasn’t even nominated. This seems anomalous but can clearly happen when you’ve got 6028 people giving five choices from hundreds of films. These days there is no rule and once again it seems that the two main awards be split with Alfonso Cuarón taking his rightful place on the stage as best director. If it were down to me Gravity would be going home with best director, film and actress but while it may only get one of those it is going to be the night’s main winner. Watch it get called out for visual effects, editing and the two sound categories as well as getting a highly deserved award for its incredible score. In terms of performances, following the BAFTA trend would have the award going to Chiwetel Ejiofor and that would certainly be justified. Bruce Dern was superb in Nebraska too. There is something that disappears from behind the eyes when someone gets dementia and somehow he captured that perfectly. Then there is Leo DiCaprio who is undeniably one of the finest actors of his generation but has no Oscar to show it yet. I didn’t particular like The Wolf of a Wall Street but he is brilliant in it. None of this will matter though because (and who’d have predicted this four years ago?) this is Matthew McConaughey’s moment. The Texan seems to have totally transformed his career recently, emerging as one of American cinema’s best character actors, but if you look you will see that he has always sought to take interesting roles among the rom coms and adventure movies. Still Hollywood thinks they’ve got themselves a reinvention and Hollywood loves a reinvention, just ask Ben Affleck. I’ve not seen Dallas Buyers Club but I understand McConaughey is excellent in it. Of course I should be judging the award on a single performance shouldn’t I, not on an actor’s whole career? That’s what Academy voters always do after all. In a total contrast to last year, the list for best supporting actor has no previous winners in it. I think Bradley Cooper will be hoping it will come down to who has the best hair and so it will with Jared Leto taking the award. I am resigned to Cate Blanchett winning best actress for Blue Jasmine and Jennifer Lawrence best supporting for American Hustle. They are both superb and it will be a nice response to the daft journalist who asked Lawrence if she thought she had peaked after last year’s win. I have long wanted those awards to go to these films only not this way round. Amy Adams in American Hustle is easily the equal of Blanchett and after several previous nominations really ought to win. Similarly Sally Hawkins is typically brilliant in Blue Jasmine and that film relies on her just as much as Galadriel. Of course if you want to talk about someone carrying a movie you need look no further than Sandra Bullock but alas that seems even less likely. Continuing with the list of shoe ins, Frozen is going to take best animated feature. (Despicable Me 2? Please!) It faces strong competition from France and Japan but the pioneers of animation have brought their A-game so everyone else needn’t make the trip. The best animated short could feasibly go to the cartoon that played before Frozen on release. Get a Horse has a classic style Mickey Mouse and friends bursting out of black and white and into colourful (and totally effective) 3D. It is a celebration of old and new film making which I think the Hollywood elite will love and it says more about the enduring magic of Walt Disney in five minutes than Saving Mr. Banks managed in a hundred and twenty five. Personally I’d like the winner here to be Room on the Broom just for the amount of pleasure repeated (and repeated and repeated) viewings have given my youngest daughter. Nonetheless with Frozen and Get a Horse Disney have returned to form and will be rewarded for it. Let it Go will get best original song for precisely the same reasons. Best original screenplay was another one I was initially wavering over. I thought it might go to Her for its invention and vision. Next year we will all be laughing about how wrong Back to the Future 2 got it but soon after that we might have to admit that Her got it spot on. It won’t be Her though, it’ll be American Hustle, original in this sense just meaning not adapted from an existing source rather than new, fresh and inventive. It is a good script and it gives great actors something to work with but it isn’t groundbreaking or in any way surprising. It was a pleasant surprise to see Steve Coogan walking up into the stage for Philomena’s adapted screenplay at the BAFTAs but I don’t think that is going to happen at the Oscars. BAFTA is still a little bit flag waving and Coogan is a little bit of national treasure for middle class, middle aged Britain. Still, 12 Years a Slave has that one in the bag this time around. If Argo’s win was because it showed the film industry saving lives, as has been suggested, then there is no question surrounding this year’s Best Documentary Feature. The Act of Killing has members of the Indonesian death squads confronting their crimes through the medium of cinema. That has to make Hollywood feel good about what they do. Best Foreign Language Film is slightly more interesting. Denmark’s The Hunt is certainly the highest profile contender in the UK but I’m not sure how it has been received stateside. Obviously we love our Scandi-dramas over here and I’d love to sanctimoniously say that when they find a foreign show they like in the US they remake it in English. Of course with The Bridge’s transformation into The Tunnel we have done the same thing. Italy’s The Great Beauty seems to celebrate Italy a lot which may not have the most international appeal. Belgium and Palestine’s entries are about love in extreme circumstances but I think it is Cambodia’s The Missing Picture that will take it. 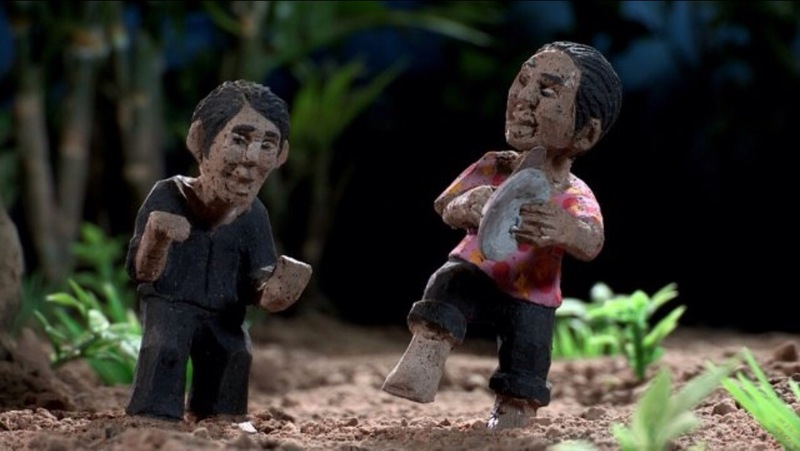 The film won the Certain Regard prize at Cannes and exposes the mass murder and barbaric crimes of the Khmer Rouge. Interestingly it does this largely through the use of crude carved figurines (pictured). It is a bold choice but I think it will pay off when the envelope is torn open. If the subject matter weren’t so desperately serious we could expect images of the main US films done out in the same way. It would be nice to see a little wooden Leonardo DiCaprio but I guess we’ve got Titanic for that (boom, boom). Clearly the Academy Awards are considered the big ones and as such they close the awards season. Unfortunately by the time we’ve had the BAFTAs, The Globes Globes, The SAGs, The DGAs and The Independent Spirit Awards and the same films keep winning we rarely get any surprises.